I absolutely can’t believe that it’s less than two months until Christmas!!! Of all the holiday traditions, I am most thrilled about decorating the tree, preparing new recipes for festive feasts and unwrapping my Christmas Stocking! As much as I enjoy unwrapping my stocking on Christmas morning which is typically filled with Toblerone bars, socks, books, and more chocolate (thanks to Kyle), I equally enjoy shopping for them! I love curating themed stockings and finding unique items that corresponds to the theme. The best part about this approach is, you are able to still personalize each and every item to suit the recipient’s preferences. 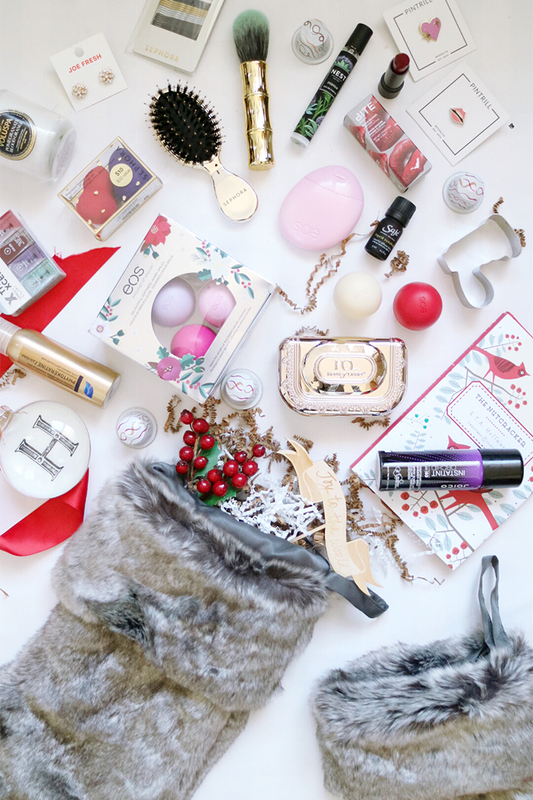 Having the opportunity to try so many great beauty products, I’ve decided to surprise a few friends with a Beauty Themed Christmas stocking this year so that they can also experience some of my favourite products! 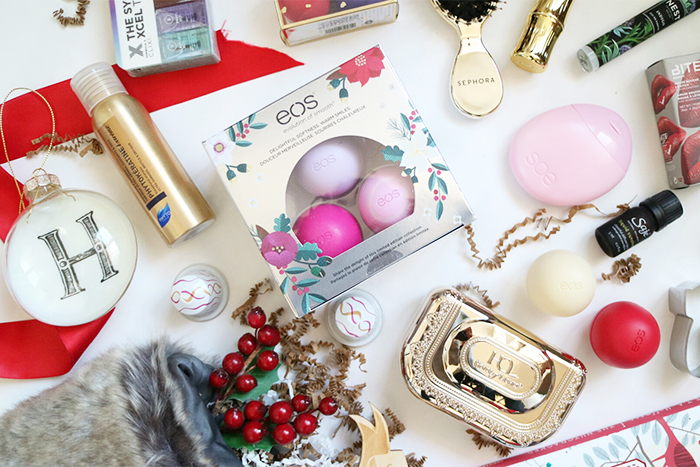 Keep reading for the ultimate beauty stocking stuffers shopping list! When it comes to shopping for stocking stuffers, the trick is to find a variety of products smaller in size. Think lip balms, hair brushes, essentials oils, etc. That way you can at least get 8 – 10 items in there! 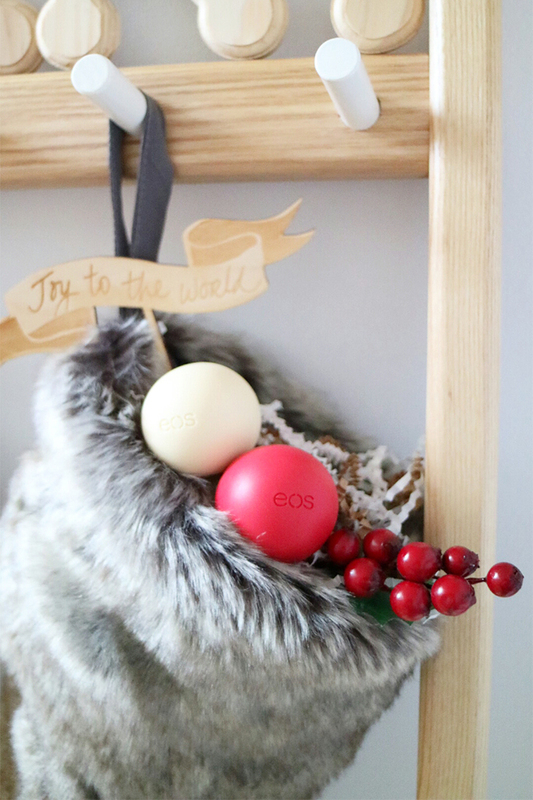 A must-have for your shopping list are eos organic lip balms. They are perfect as stocking stuffers because they come in so many fun colours and flavours! For this season, they’ve released two new limited edition holiday packs (2-pack of organic Vanilla Bean and Winterberry and 3-pack of Visibly Soft Honey Apple, organic Wildberry and Passion Fruit) which means you can either separate them into individuals or stuff a full pack into the stocking! I’ve been a long-time user of eos organic smooth spheres. I was originally drawn by the unique shape and array of color (7 different flavours!) but soon learned that this product is also 100% natural, 95% organic and non-GMO, which is awesome! They also contain antioxidant-rich Vitamin E, shea butter, and jojoba oil that make them super moisturizing and healthy for the lips. 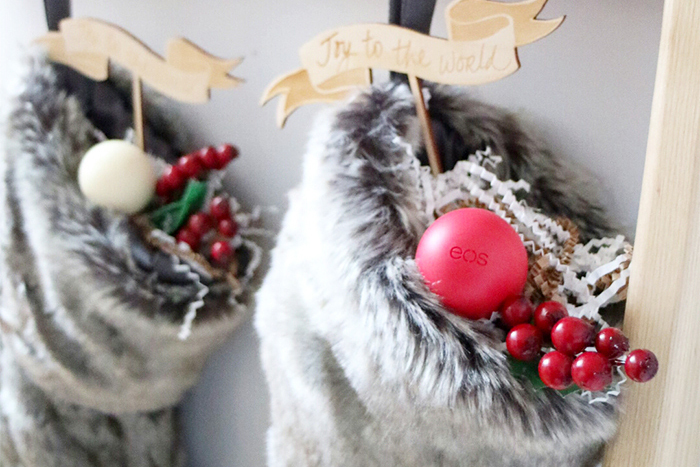 Aside from including eos organic lip balms that you think your friends will love and enjoy, I’ve also included a few extra items for your shopping list to curate the best Beauty Themed Stocking this season! 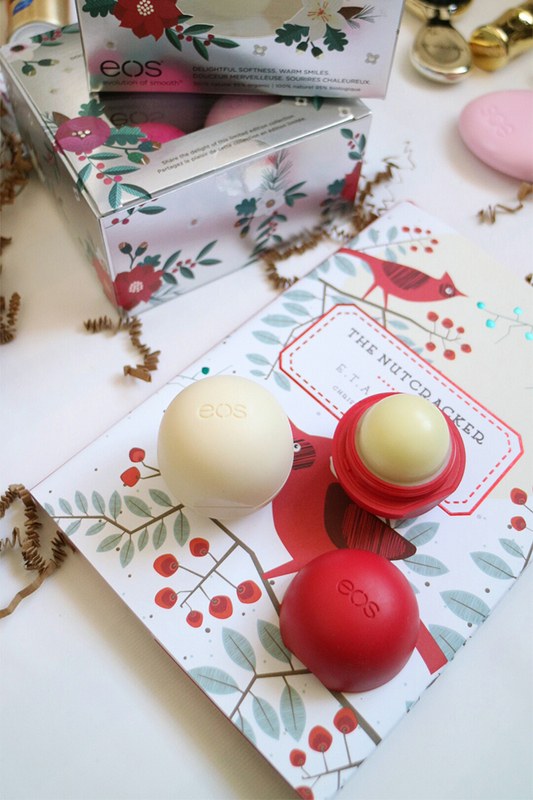 eos organic lip balms or try eos hand lotions too! 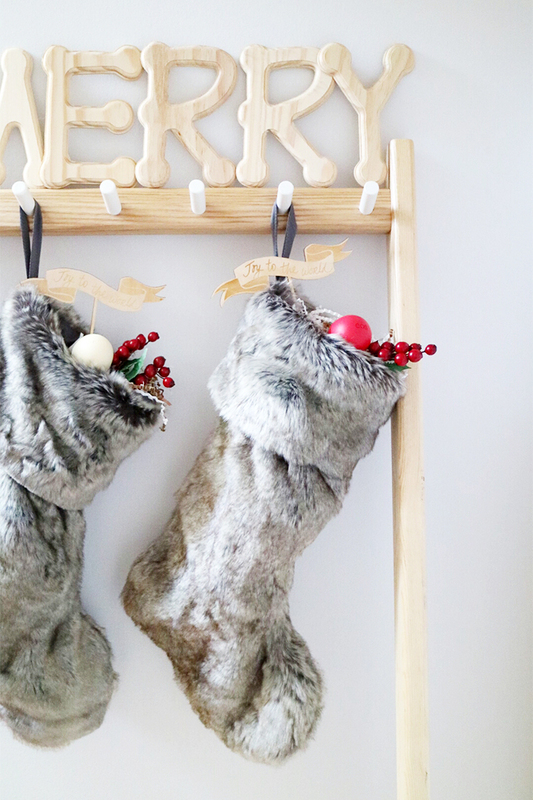 Once you’ve prepared all your goodies, fill each stocking and if you’re looking for an extra added touch, use luxurious faux fur stockings and top them with festive decorations. Your friends will be over the moon for these ‘bundles’ of joy and they can reuse the stockings for next holiday season. Disclaimer: This is a sponsored conversation written by me on behalf of eos Products LLC. The opinions and text are all mine. Outfit :: Oversized Cardi & Leopard Print + $100 Giveaway!